A novel double perovskite tantalite orange–red light emitting Sr2LuTaO6:Sm3+ phosphor was synthesized by the solid state reaction. The phase, crystal structure, photoluminescence properties, thermal stability and decay curves were studied. The X-ray diffraction patterns indicated that the phosphor has a pure phase of cubic phase structure. Excited by near-ultraviolet light at 407 nm, the sample exhibited three sharp emission peaks at 564 nm, 600 nm, 645 nm corresponding to the 4G5/2 → 6HJ (J = 5/2, 7/2 and 9/2) transitions, respectively. The optimum doping concentration of Sm3+ ions was determined to be 5 mol% and the concentration quenching process comes from the energy transfer among nearest-neighbor ions. The as-prepared phosphors showed excellent thermal stability, the integral intensity at 423 K is about 91.10% of the initial intensity. The CIE chromaticity coordinates of Sr2LuTaO6:Sm3+ phosphors located in orange–red region. 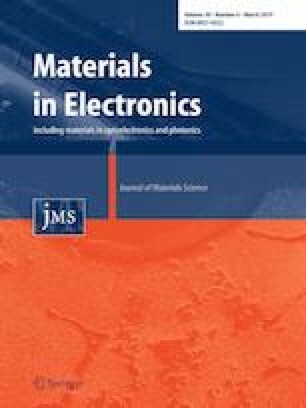 The results suggest that Sr2LuTaO6:Sm3+ phosphors have great potential application in white light-emitting diodes. This work is supported by National Natural Science Foundation of China (No. 21576002 and 61705003), Scientific Research Common Program of Beijing Municipal Commission of Education (SQKM201710011009) and Scientific Research Ability Promotion Plan of Graduate Student of Beijing Technology and Business University.